It's unfortunate. Now that online trolls can find you and harass you at home some consumers are dumping the online gaming service altogether. I guess teaming up with Blizzard seemed like a way for Facebook to stop the bleeding once privacy advocates declared war on their public-private collusion racket by LEAVING. You can get more friends. You can find another gaming community. However, it's much harder to regain your privacy. Like money or your virginity, once it's gone, it's gone. So it is no game now that Blizzard sees customers ditching their services for the same reasons that people are abandoning Facecrook. If the level of dissent displayed against Blizzard is any example of how online communities respond to Internet identity mandates, expressing complaints now might create a difference in national Cyber Security. The White House has a new plan for a national online ID number. Online users can share privacy concerns and problematic example experiences with Blizzard's Real ID system and compare it to President Obama's national online identity number proposal. The National Strategy for Trusted Identity in Cyberspace or the NSTIC forum on IdeaScale will be taking comments until July 19th, 2010. The online number would be a tax-financed system for users to create a voluntary online ID number. This number would be interoperable for use as proof of identity between users, financial institutions and other private services of their choice. The good news is that NSTIC adopters, for now, can opt out if they want to stop using their online number. 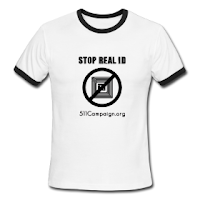 Like Real ID (vs. RealID) and other national identity programs, NSTIC has some potential for mission creep and privacy flaws which is cause for concern. One day we might inherit an online identifier which eventually gains so much steam from voluntary adoption that it replaces the Social Security number. Let's not forget why governments want to enumerate the people in the first place - population control. So here's to you, World of Warcraft gamers - because you deserve better. Take time to read up on your Social Networking Bill of Rights and the NSTIC proposal. Here's a pathway to opting out of BLIZZARDs Real ID program. Mother on criminal justice failure : "Do not give up." BTC - A 2-4 year sentence was given to an officer who shot a young black man at point blank range in Oakland California. "The biggest concern is that the government not be put in the middle of private networks so that it monitors private communications for cybersecurity purposes," said Gregory Nojeim, senior director at the Center for Democracy andTechnology." The Senate bill on Cyber Security passes one chamber and the TSA could not wait for an option to block "controversial opinion" for their employees. DIY GOVERNMENT: HOST A FOIA PARTY! WSJ: United States recipe for population control? "Secure the borders, count the people, declare martial law." "From medical confidentiality and the right to opt out of the Summary Care Record to the unlawful retention of innocent people's profiles on the DNA database; from snooping on communications data (your phone, e-mail and browsing records) to rampant government sponsored data trafficking, such as was proposed in Clause 152 of the Coroners & Justice Bill; from highlighting the dangers of population registers and systems like Contactpoint to pressing for more meaningful control over our own personal information - NO2ID must go on." Nick Clegg's "laws you want axed"
Lifelock is running infomercials or just really long ads on TV. The LifeLock CEO's identity stolen 13 times in the past. 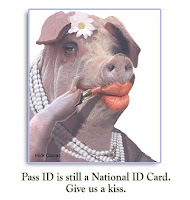 "Montana is one of several states that have balked at a federal law requiring states to issue tamper-proof identification cards to residents. Gov. Brian Schweitzer discusses his state's opposition." "The concept is simple," Napolitano said. "If you are on a train, or standing on a platform, on in a station or public place and you see something that doesn’t look right, or out of place, like an unattended package or bag, or an individual acting in a suspicious manner, report it to law enforcement." BTC - "If you see something, say something..." Here's what I've been seeing lately. After relocating the to the Bay Area I've noticed a lot more surveillance cameras in public transit areas and speaker messages which promote suspicious activity reporting. It's not at every station - just on BART, when you exit Millbrae to Caltrain. If you board the San Jose DASH from the train a recorded announcement will ask you to "report any unattended packages" to the driver. I recall one Spring afternoon day, up to five police personnel manning entryways on an inbound train to San Francisco. There wasn't any posting or announcements on the train to explain this extra presence to passengers. On Friday afternoon there was a sobriety checkpoint where police stopped to ask for licenses in my suburban, one stoplight area coming from the freeway. I asked my friend to stop and let me out before the cones. A police officer then openly insulted me for getting out and walking to the sidewalk. I wasn't volunteering up for a random identity surveillance measure or for the engagement snare. A single mother of two said starkly at a Starbucks after I handed her a postcard, "It's becoming a police state!" The US is incorporating a public surveillance practice used in the UK which may dump random things you do into a terrorism watch fusion center. Suspicious Activity reports or SARs are handled as "national security" domestic intelligence run by local law enforcement. It's not based on actual crime or reasonable suspicion. It's based on "reasonable indication" of a crime. What does that mean? Well if someone indicates to law enforcement that you may be a criminal, you get a history in a terror watch database. In the 80's we used to deride the USSR for abusing suspicious activity reporting practices because it was how "the commies" used threat of intimidation on their people and how neighbors exercised vengance on those they didn't like. We used to think "wow, I'm glad it's not like that over here." Well, it's my unfortunate duty to report modern America is operating just like fallen communist Russia.